"I love blue so dark that it appears black. I like black which takes depths of dusk." — Narciso Rodriguez. Judging from the Narciso Rodriguez perfume line, I think Rodriguez may be more inspired by color (fabrics, packaging) than odor, for when it comes to the men's perfumes at least, I say: 'Love the bottles...don't need the colognes.' The Rodriguez men's offerings have been nice enough, but never possess a 'certain something' that makes me crave them. 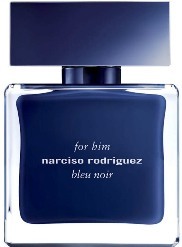 For Him Bleu Noir is a flanker to 2007's Narciso Rodriguez For Him and is categorized as an aromatic fougère fragrance; its listed notes include nutmeg, cardamom, musk, cedar, ebony, vetiver and amber (not very fougère-y notes, which is fine for someone like me who usually dislikes that genre). Many guys have commented online that For Him Bleu Noir reminds them of Cartier Déclaration or Hermès Terre d'Hermès (both developed by perfumer Jean-Claude Ellena)...more on that later. 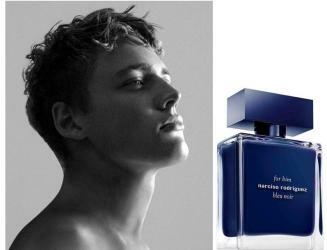 For Him Bleu Noir goes on smelling a bit "sweaty" (bigarade? grapefruit? ); this phase is reminiscent of Déclaration. Next up is cardamom with a smidgen of silky "cosmetic" cedar (nothing to remind you of nature, plenty to remind you of a department store men's fragrance bar.) Almost all the For Him Bleu Noir notes are blurry (well-blended). For me, the base of For Him Bleu Noir is most like Terre d'Hermès: light, semi-sweet musk and vetiver, with lingering (now talc-y) citrus. For Him Bleu Noir is likable and wearable (I enjoy this flanker better than the original); it has good lasting power and its citrus accord, my favorite part of the perfume, lasts till the sweet end. But: For Him Bleu Noir does not engage me enough to buy it (though if a bottle walked in my front door and jumped into my perfume cabinet, I'd certainly spray it on from time to time). Déclaration and Terre d'Hermès do share some "moments" and notes with For Him Bleu Noir — orange, cardamom, cedar, vetiver — but Déclaration and Terre d'Hermès are, to my nose, different (and better) — Déclaration is livelier/raunchier than For Him Bleu Noir, Terre d'Hermès quirkier. Surprisingly, as of today, many months into launch, the Narciso Rodriguez website does not feature even an image of For Him Bleu Noir, let alone a video or dedicated website! As a Narciso (2014) devotee, I can attest to the fact that their website is dreadfully slow when it comes to new fragrance launches, even when they’re not that new. Seems very much like a fashion first, fragrance second house, which is a shame because they’ve been one of the finest designer fragrance houses since they launched For Her. Lizzy…I’m always surprised at how ‘lumbering’ so many designer websites are…not just NR. Peter…that one I could not smell at all…musk no doubt. Just happened to sample this in Nordstrom last week, and I agree with the comparison toTerre and Declaration, both of which are more interesting to me. My initial thoughts upon trying Bleu Noir was ‘Terre d’Hermès with pineapple’. This would have been perfectly fine, were it not for the rather voluble amber note. There was something of the Lumbersexual about it. Kevin, I used to love the NR, For Him when it launched, then the love affair quickly died. I initially remember it as a lovely dark musk with patchouli, and an underlying violet base from beginning to end. When I purchased a bottle two years ago it smelled completely different like a singular violet note fragrance. I was going to give this one a sniff, but maybe not. Lindeberg…well, if it crosses your path, give it a sniff. Beautiful bottle. The juice sounds positively yawn-worthy. I always liked the way the original smelled like wet cement. But never enough to own a bottle. I’ve always thought Terre d’Hermes was interesting but TOO MUCH, so I might try this if I find myself in a Nordstroms. I’m completely confused by the women’s line; I’ll never sort out which ones I’ve tried and which I haven’t. IFRA could make itself useful by issuing a regulation requiring that if brand is going to use the same bottle for every perfume, they MUST have distinct names. Noz…the names of the NR brand are a mess!